The recent addition of artboards to Photoshop introduced new ways of working within the application. It also introduced a few new challenges, like the relationship of guides and artboards. With this release we've improved guides with a focus on artboard interactions. Artboards now have their own unique guides. Any new guide created with an artboard selected, whether from the rulers or via the New Guide dialog, will be associated with the artboard. An artboard's guides are only visible if the artboard is selected. Artboard guides are dark blue by default to differentiate them from the cyan canvas guides. No artboards have been selected. When Artboard 1 is selected, the guides associated with it become visible. When the second artboard is selected, Artboard 1 guides disappear. We've also added a preference to display inactive artboard guides. With this preference toggled on, all guides within the document visible. The default stroke style for inactive guides is dashed, which will make them appear slightly lighter than the solid active artboard guides. In October of last year we released a feature called Guide Layout. The feature could create a grid within the document that is useful for designing web and mobile apps. Artboards did not exist at the time of it's introduction, so it was only able to apply a grid to the entire canvas. We've revisited this feature with the latest release and have added additional functionality. Target allows layouts to be placed within any portion of the document. The default, "Selected Artboards", applies layouts to all actively selected artboards. All artboards within the document are listed, so a single artboard can be selected. 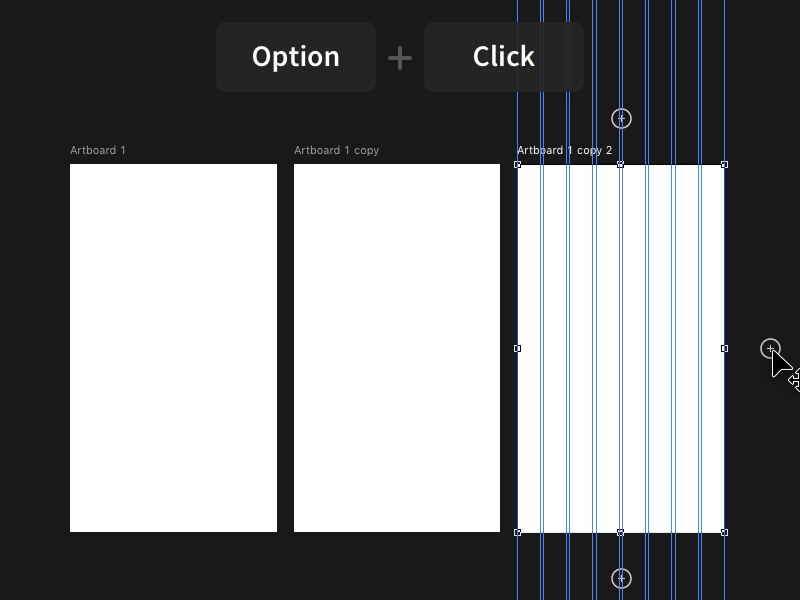 "All Artboards" applies layouts to all artboards throughout the document. The old behavior is listed here as "Canvas", which could come in handy if organizing artboards within the document. Artboards can now be quickly duplicated on canvas. This is done by clicking the title (Ex. Artboard 1) to select an artboard. Plus buttons will appear around the edges of the artboard. These buttons create a new artboard next to the previous one. Here's a neat trick though...holding down option and clicking duplicates the artboard and it's guides.